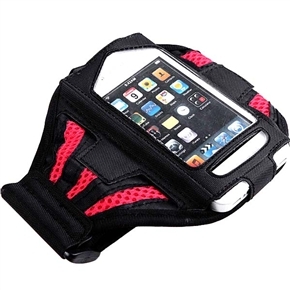 If you want to secure your iPhone 4 and iPhone 4S while exercising and operate it easily, this black & red armband must be a great choice for you. The adjustable belt with Velcro closure provides a snug fit around your arms. And with a transparent faceplate on the holder case, you can view and access all function of touch screen navigation without removing the skin. Just get it! - Color: black & red. - Ideal to hold iPhone 4 and iPhone 4S while doing sports. - Fit for arm girth between 30cm and 40cm. - Transparent faceplate serves as a screen protector. Fast Shipping! Great Price, an AWESOME seller!! thanks so much! If you want to secure your iPhone 4 and iPhone 4S while exercising and operate it easily, this black & red armband must be a great choice for you. The adjustable belt with Velcro closure provides a snug fit around your arms.